Ice cream cones make an already amazing ice cream superb, wouldn’t you agree? I love anything crunchy so having the delight against the crunchy cone has always been my preferred way to enjoy ice cream. Growing up, if I was at a an ice cream shop and there was a choice, I always went for the cone without fail. 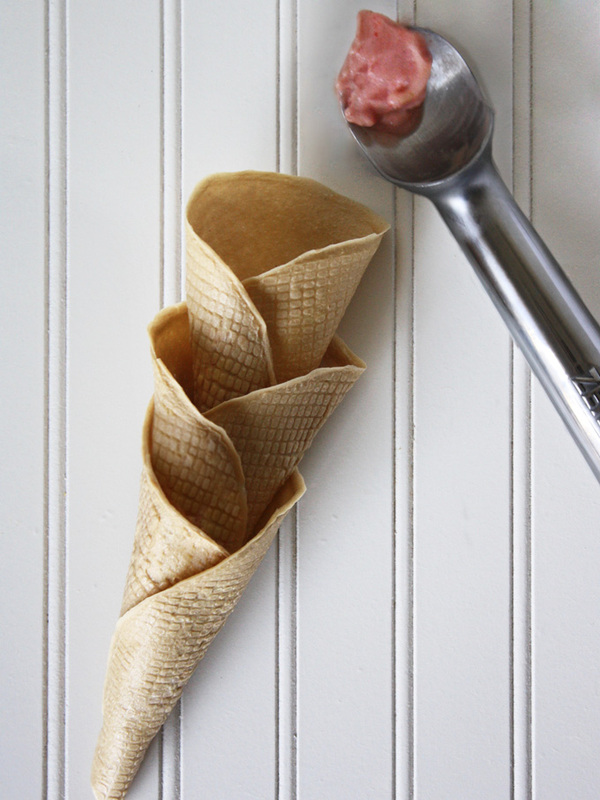 So of course, I had to make my own raw vegan ice cream cone, and it sure wasn’t easy! But I finally have it to share it with the world. It is crunchy, with a hint of sweetness and vanilla flavor that will be a perfect accompaniment for raw vegan banana ice cream, aka “nice cream”, or any raw or vegan ice cream. The main ingredient in this recipe is young coconut meat. 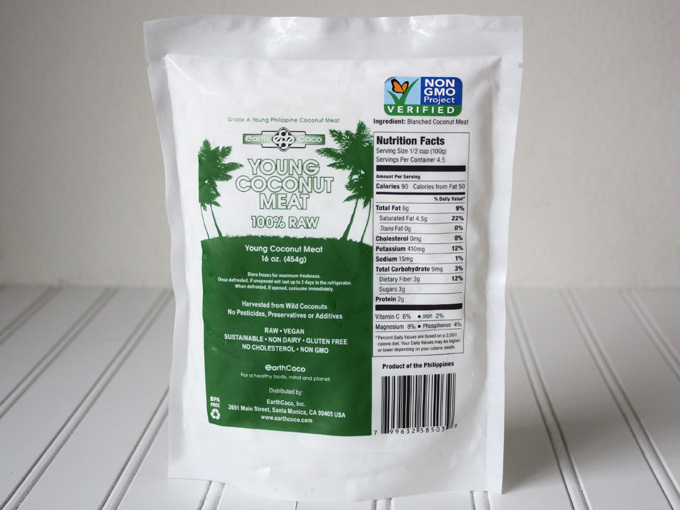 Instead of cracking the young coconuts open, you can find some prepared raw young coconut meat in the frozen section at most health food stores these days. I enjoy opening coconuts but this definitely is a much easier and cleaner option, especially if you are not comfortable with opening young coconuts yourself. Another ingredient I use in this recipe that might surprise you is kelp noodles. 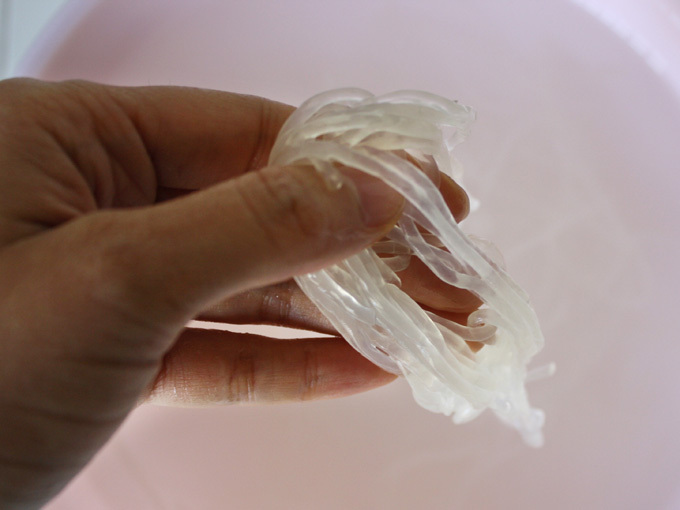 Kelp noodles are glass noodle like raw vegan noodles made from, you guessed it kelp! A type of seaweed. 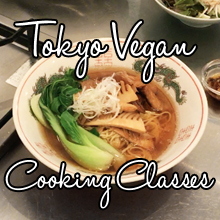 It’s used as a noodle substitute in raw foods, but it can also be used in sweets recipes. 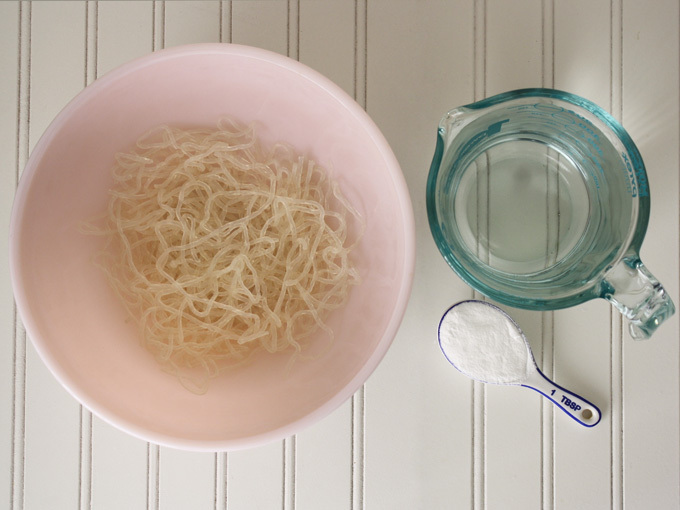 Kelp noodles when blended together with the young coconut meat, help the young coconut meat mixture dry crispier in the dehydrator. You can find kelp noodles at health food stores in the refrigerated section. Here’s an Amazon link in case you are interested in finding it on Amazon. This is the price for 2 packs, but you only need about a half of a bag for one recipe. You can toss the left over kelp noodles with a raw cream sauce and enjoy it as a creamy noodle dish. 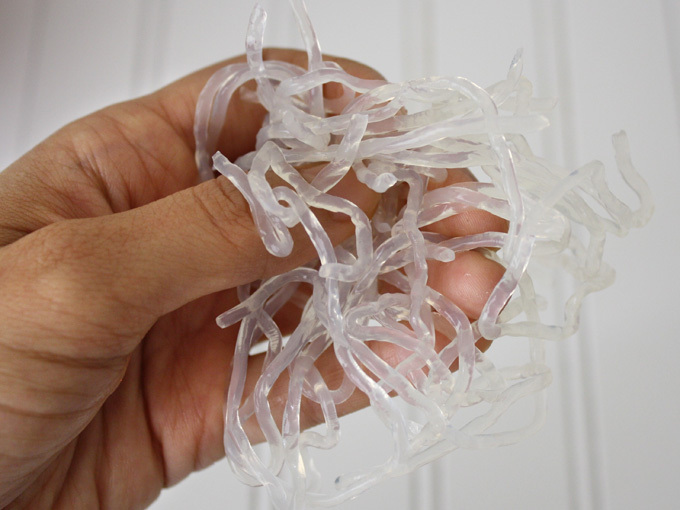 Kelp noodles, straight out of the bag look like this. It’s springy and crunchy, so to make it more into a noodle like texture, we need to soak it in a warm baking soda bath. 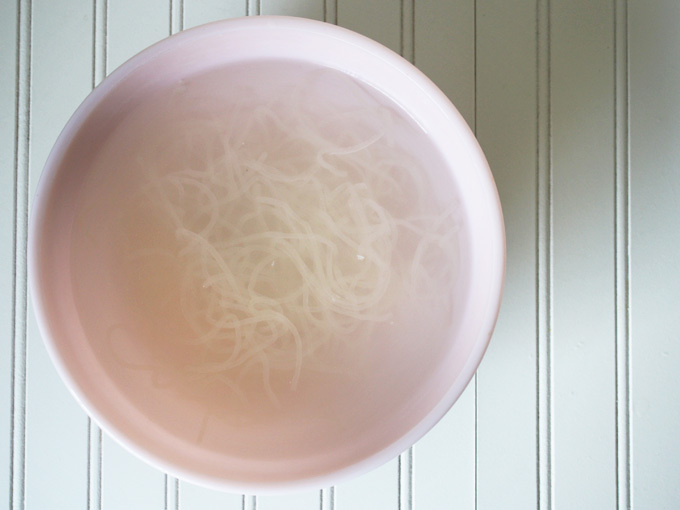 In a large bowl, place the kelp noodles and pour in and submerge the kelp noodles with plenty of warm water. this!! What a difference right? It now has a texture close to glass noodles. 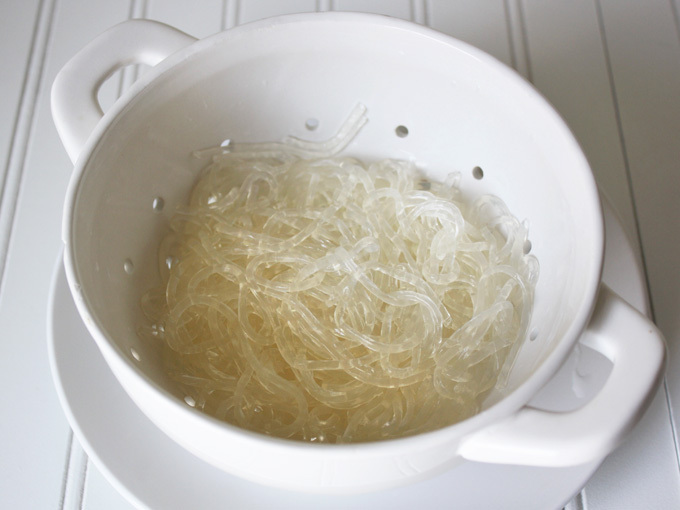 Rinse the kelp noodles really well (we don’t want it tasting like baking soda), and drain. Now that the kelp noodles are ready, let’s make the ice cream cone mixture. 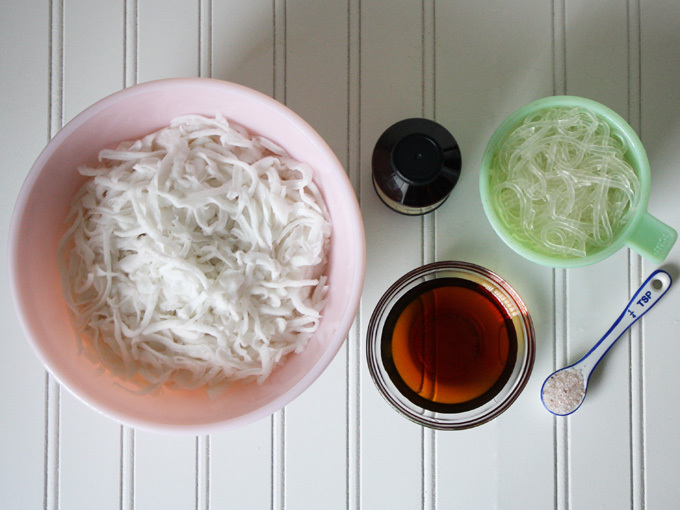 Add the young coconut meat, kelp noodles, maple syrup, vanilla extract, and salt into a blender and blend until it becomes a smooth but thick mixture. If you are using a Vitamix, use the tamper to help blend the thicker mixture. If you are using a regular blender and having trouble blending because of its thickness, add a little bit of water, but only the minimum amount you need to blend it smooth and no more! It should be a thick paste like mixture when you are done blending. Time to dry this mixture! 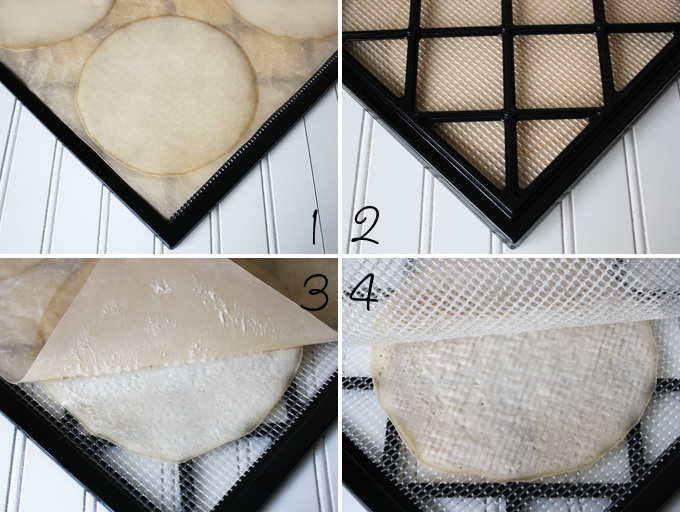 On a dehydrator tray, lay down a mesh and a silicone sheet. Spread the mixture into the desired size you would like your ice cream cones to be, making the thickness about 1/4 inch thickness. My rounds were about 6 1/2 inches in length and with this size, the mixture makes 6 cones. *Set aside about an 1/8 cup of the mixture aside and store it in the refrigerator. We’ll use it as a glue later on when we shape the cones. Put the dehydrator sheets in the dehydrator and dry at 115℉ for a couple of hours until the surface of the mixture dries and forms a skin. Once the surface is dry, take the tray out of the dehydrator. It’s time to flip the sheet. Place another mesh sheet, then another dehydrator tray on top and flip the trays upside down. Take off the dehydrator tray and the mesh sheet on top and peel off the silicone sheet. Now that the ice cream cone rounds are upside down, we’ll stamp the surface using the mesh sheet to emulate the waffle cone texture. Press the mesh sheet firmly onto the cone rounds and peel it off. Put the tray back in the dehydrator and dry for another hour. Once the surface is fairly dry, flip the rounds upside down so that the textured side is on the bottom. Now it’s time for a little bit of arts and crafts. Make paper cones by rolling the paper into cones and taping it with a piece of scotch tape. Cut the excess paper at the top so it will fit the dehydrator tray better. 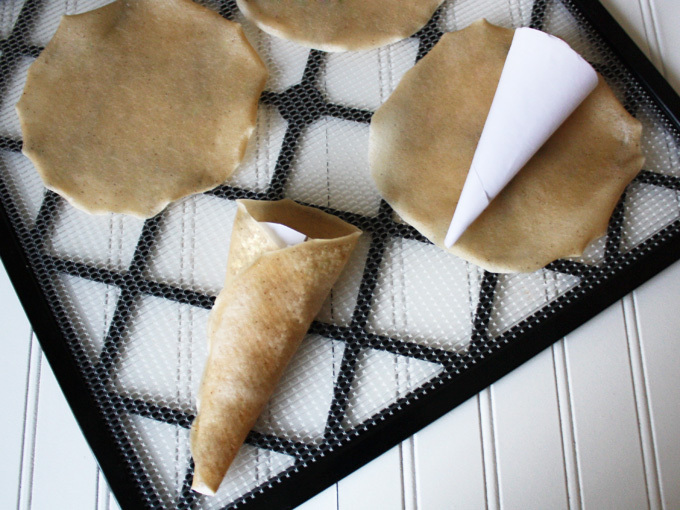 Make one paper cone for each round you have. 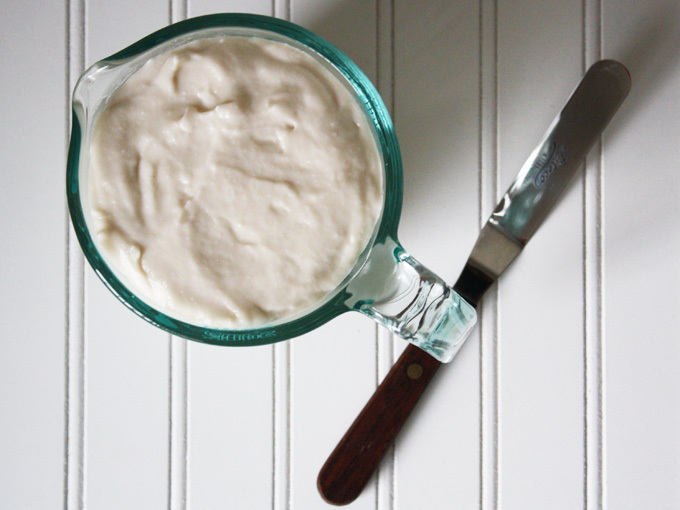 Take out the leftover ice cream cone mixture you set aside in the refrigerator. 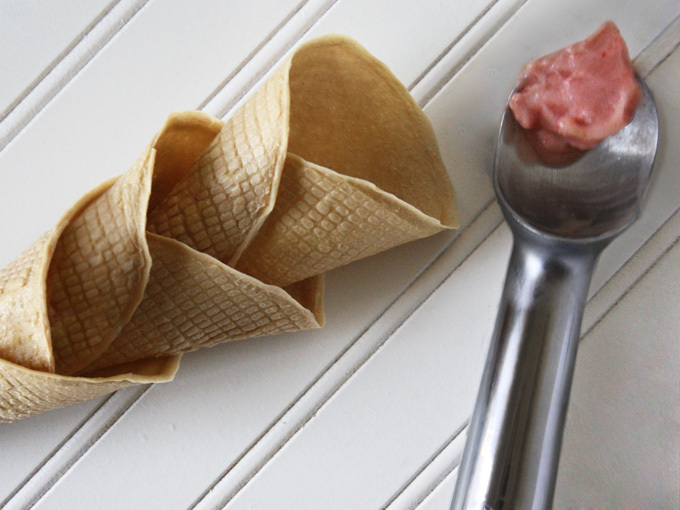 Place the paper cone in the middle of the ice cream cone rounds and roll the sides onto it to shape the cone. Take a small amount of the wet mixture and use it as a glue to hold the sides in place. Then, stuff a small amount of the mixture at the end if there is an opening to seal the cone’s bottom. Once all the cones are shaped, dry in the dehydrator for about another 21 hours until the ice cream cones are completely crunchy and crispy. Make sure when placing the cones that no paper gets close to the heating elements of the dehydrator! Tada! I give you raw vegan ice cream cones! It’s ready for you to scoop in your favorite ice cream! The coconut oil from the coconut meat makes it slightly water repellent and helps keep it crispy and not get saggy. Don’t these look pretty convincing? It’s time to put your dehydrator to work! Add in a tablespoons of baking soda and mix it in well. Let it sit for a couple of hours until the noodles become soft and has a texture close to glass noodles. Rinse the kelp noodles well and drain. Add the young coconut meat, kelp noodles, maple syrup, vanilla extract, and salt into a blender and blend until it becomes a smooth but thick mixture. If you are using a Vitamix, use the tamper to help blend the thicker mixture. If you are using a regular blender and having trouble blending because of its thickness, add a little bit of water, but only the minimum amount you need to blend it smooth and no more! It should be a thick paste like mixture when you are done blending. 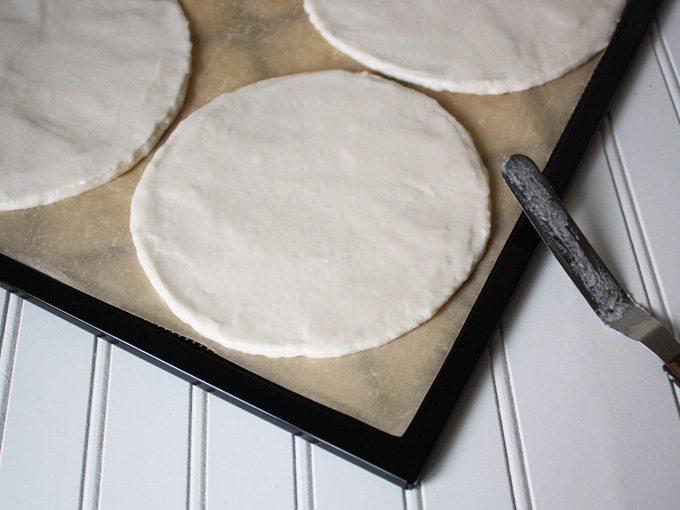 On a dehydrator tray, lay down a mesh and a silicone sheet. Spread the mixture into the desired size you would like your ice cream cones to be, making the thickness about ¼ inch thickness. My rounds were about 6½ inches in diameter and with this size, the mixture makes 6 cones. Set aside about an ⅛ cup of the mixture in the refrigerator to use as a glue later for the cones. Put the dehydrator trays in the dehydrator and dry at 115℉ for a couple of hours until the surface of the mixture dries and forms a skin. Once the surface is dry, remove the tray from the dehydrator and flip the sheet. To do so, place another mesh sheet, then another dehydrator tray on top and flip the trays upside down. Take off the dehydrator tray and the mesh sheet on top and peel off the silicone sheet. Stamp the surface using the mesh sheet to emulate a waffle cone texture. Press the mesh sheet onto the cone rounds firmly, then peel it off. Put the tray back in the dehydrator and dry for another hour. Once the surface is fairly dry, flip the rounds upside down so that the textured side is on the bottom. Make paper cones by rolling the paper into cone shapes and taping it with a piece of scotch tape. Cut the excess paper at the top so it will fit the dehydrator tray better. Make one paper cone for each round you have. Place the paper cone in the middle of the partially dried cone rounds and roll the sides up over it, into the shape of a cone. Take a small amount of the wet mixture you saved in the fridge and use it as a glue to hold the sides in place. Stuff a small amount of the mixture at the end if there is an opening to seal the cone's bottom. Dry in the dehydrator for about another 21 hours until the ice cream cones are completely crunchy and crispy. ***Make sure when placing the cones that no paper gets close to the heating elements of the dehydrator! Store in an airtight container. Keeps for one month.